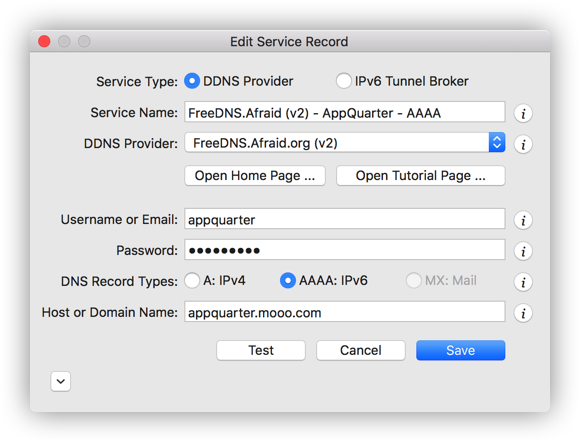 As of July 1, 2016 there are two dynamic DNS provider profiles for FreeDNS: "FreeDNS.Afraid.org", and "FreeDNS.Afraid.org (v2)". While we are continuing to support the legacy profile "FreeDNS.Afraid.org" as is, we are also adding a new profile "FreeDNS.Afraid.org (v2)". This new profile supports the new FreeDNS v2 update protocol API. The sections below shows how to create a service record for both provider profiles. The screen shot above depicts a service record example for FreeDNS.Afraid.org. Most of the fields in this dialog are self explanatory, but some fields require brief explanations. Authentication Key: The authentication key is comprised of random alpha-numeric characters. It was assigned to you by FreeDNS when you registered your host or domain name. Follow these steps to locate it. Login at FreeDNS.Afraid.org using your credentials. On the left sidebar, under the "For Members:" heading, select "Dynamic DNS". Locate the "update candidates" table at the bottom of the middle section. Select "quick cron example" for your hostname or domain. 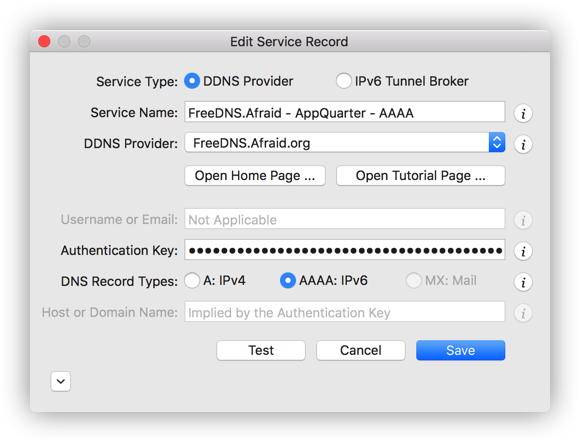 DNS Record Types: FreeDNS supports dynamic DNS records of type A, and AAAA. Host or Domain Name: Not applicable. It is uniquely identified by the authentication key.